Nothing (and often no one) ever entered the house and escaped embellishment by Lisa's hands and heart. You might end up with a ribbon in your hair, or she might encourage an elderly woman to go with an "off the shoulder" look with her dress. Some of the lucky ones would end up with lipstick kisses on their cheeks, or she might dip your hands into soft, freshly risen bread dough so that you could experience the joy of punching it down for the second rise, and then—rest assured—you would find yourself licking off whatever stuck to your hands. As her guest, YOU would become part of her art of living. Such sweet surrender it was for so many. As we started the process of documenting and archiving her pieces for this website, we began to realize that most everything that she touched with her hands was a work of art. What do you think? We'd love it if you would express yourself in the poll below. You probably recognize the classic "Addams Family" chair above. These were on sale at the Pier One store back in the 60s (maybe 70s), and my brother, Britt, and I were intent on buying one for our parents for Christmas. Problem was, how to buy it and get it home. We depended upon Daddy for that. I'll never forget the excitement as we found the chair and circled it. It was perfect. We'd emptied our piggy banks of every coin, and I don't doubt that Daddy might have contributed from his own pocket to the occasion. This chair was actually used in our house, albeit I never ever thought it was comfortable by any stretch of the imagination. In fact, Britt and I used it as our Bat Mobile when pretending to be Batman and Robin. The large back of the chair was the front of the Bat Mobile, and we'd push it across the wood floor of the living room etching our escapes as we went along. Mom never stopped us. We were just participating in creating another piece of art. Over the years the Bat Mobile....er, chair...slowly deteriorated, and was lovingly wrapped with fabric bandages to hold it together. Mom made most everything that you see on this chair. 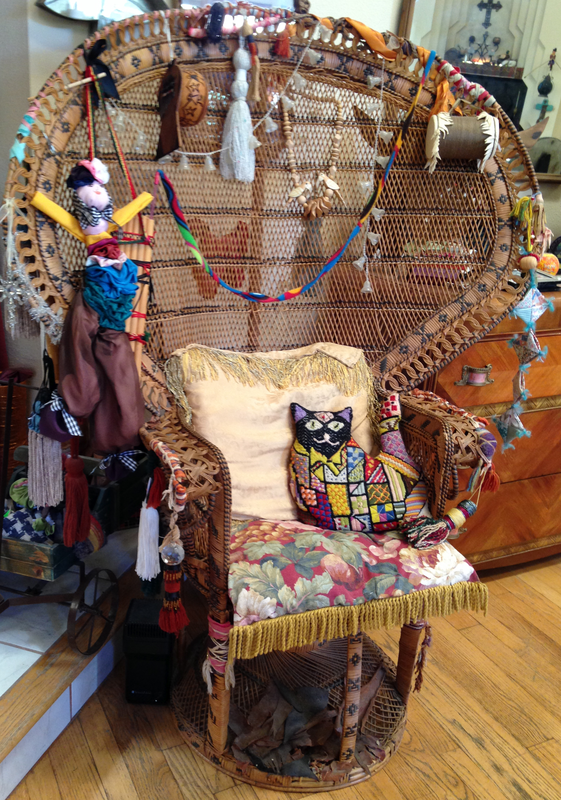 The puppet on the left, the kitty pillow and other pillows, the dangling things...and if you look closely at the bottom, she "wired" the base of the chair together with criss crossed fabric pieces glued into place. No one sits in the chair anymore. It stands as a loving icon of remembrance of the life that Mommy cherished with her family and children. When I lost my home in 2009, I gave Mom this wagon that I'd purchased from a catalog. She was ever so grateful to receive anything that might have been tossed in the trash. Many of her friends will attest to that fact. Of course, it was always a joy to see the items being put to use. In 2009, she was beginning to have a recurrence of the cancer that eventually devoured her body (but, couldn't touch her spirit). The cowboy boots in the back are ones that I used to wear. I wasn't nearly as flamboyant as my mother. I wore blue jeans and flannel shirts, and loved my cowboy boots more than anything, although I grew up in Los Angeles. 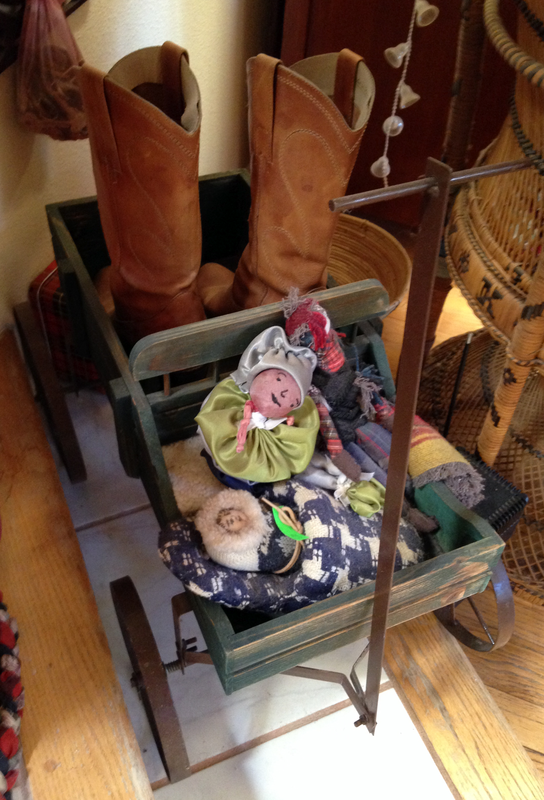 The little dolls in the front of this tiny wagon were created by her in 2009. This is the period in which her art became diminutive due to loss of control of her hands, and her lack of energy because of the new chemotherapy treatments. You can see a very happy Mommy doll carrying a papoose—a Native American child, which my mother was, having been born to a Native American father—and if you carefully look to the right in the photo, you will see a rather tired looking ragdoll hanging out. I have a degree in English Literature from U.C.L.A., and the more I study my mother's art as I compile this website, the more I am seeing the symbolism in what she created; the development of characters, and the plot of her journey in life.